I have to say I am loving the Human Evolution: Past and Future MOOC (massive open online course) as it continues into the 2nd week. I am not currently at university or in a position to access journal articles easily so I really value the fact that the team behind the MOOC and Coursera have put together such an informative and up to date course. Could you imagine if you were taking part in that course, or any of the hundreds of other free online courses offered by Coursera, and woke up one day to find that your access to the course had been shut off? Unfortunately that is now the reality for any one taking a Coursera MOOC in Iran, Cuba or Sudan. In a blog entry dated to the 28th of January 2014 at 8.22pm Coursera declared that the US government had enacted a sanction on the US based course provider effectively blocking any access to courses in the above three countries. Syria was also blocked but that has since been lifted. “Providing access to education for everyone has always been at the core of Coursera’s mission, and it is with deep regret that we have had to make a change to our accessibility in some countries. Certain United States export control regulations prohibit U.S. businesses, such as MOOC providers like Coursera, from offering services to users in sanctioned countries, including Cuba, Iran, Sudan, and Syria. Under the law, certain aspects of Coursera’s course offerings are considered services and are therefore subject to restrictions in sanctioned countries, with the exception of Syria (see below). Our global community is incredibly valuable to us and we remain committed to providing quality to education to all. During this time, we empathize with the frustrations of students who are affected by this change and we have made it a top priority to make rapid progress toward a solution” (Read the full entry here). There are also worries that people living along the borders of these countries will also be affected by the ban. Although Coursera is based in America there are a high number of its academic staff and organisation partners based all over the world. This has affected many academic institutions and individuals. I dearly hope this is temporary. To my mind it seems a bit of a step backwards to limit the accessibility of free online academic courses. I have blogged on related topics before about the value of MOOCs, of Iran’s often restrictive attitude to education, and I’ve also highlighted just how little a proportion of the world’s population have access to the internet itself. I have also blogged before about my worries for net neutrality in a quickly changing world. It has to be said that there are sadly a number of countries that ban or severely limit access to the world wide web, with China having a particularly strict firewall. Some countries have a very limited internet capability while others simply have a very mobile population. There are a number of programs and software installations that can be used to circumvent the IP address ban. These can include VPN (Virtual Private Networks) or use of the free Tor software (see comments below though), a program which allows anonymity and censorship resistance and is widely used by the public, clandestine humanitarian centers and undercover agents. There are a number of other methods that can be used as well – see here. Be aware that the above methods of internet anonymity may be illegal in certain countries and is no way encouraged. I will try to keep abreast of this development in the accessibility of Coursera MOOCs and I will update this entry as necessary and appropriate. Sign this Avaaz petition to keep the internet neutral, as the US and the EU are currently debating new legislation giving private companies the right to give content fast. Another quick post here but one that highlights a project that is pretty impressive in its implications for palaeoanthropology. Also noted here is the start of a MOOC (Massively open online course) on human evolution that may interest the readers of this blog. The Rising Star Expedition in South Africa has uncovered around 1200 skeletal elements from around 12 individual hominins in the first season of excavation, an unparalleled find in the excavation of palaeoanthropological sites. 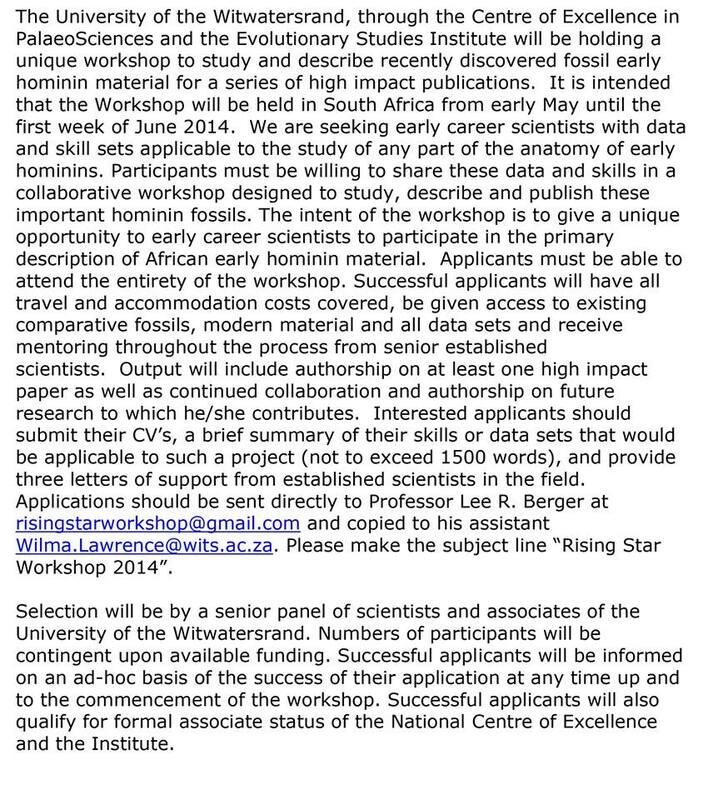 Now the project is advertising openly for early career scientists to examine and describe the skeletal remains found in the cave (my favourite quote: “Palaeoheaven has arrived, it’s just solid fossils”). This is a unique opportunity in the field of paelaeoanthropology. Typically fossil hominin sites are kept secret with only a lucky few allowed access to prepare, study and describe the fossils once they have been carefully excavated on site and taken to a palaeo laboratory to be looked at in more detail. This is usually a process that can take years of careful work by a small team. But the Rising Star Expedition has been different from the very beginning, with key members of the team tweeting and blogging every incredible scene of the South African cave site and openly advertising for participants. Now the team have advertised for early career scientists to apply for the chance to study the hominin fossils. As stated on John Hawks blog entry on the advertisement, the Rising Star team want to recruit a large group of scientists to come together for a five-week long workshop in May/June of this year to study the remains and produce the first high quality and high impact research papers on this batch of fossil hominins. The announcement by Lee Berger, professor at the university of the Witwatersrand in South Africa and describer of Australopithecus sediba, found at the Malapa site. Graduate students who have finished their data collection, and have the support of their supervisors, will also be considered for the opportunity. As John Hawks states in his blog post the applicant for the workshop should be very clear in stating their experience and the datasets that they can bring to the project, be clear about your own skills, knowledge and value and do not be afraid to apply. This is a fantastic opportunity to be involved in the study of human evolution, at the very cutting edge of the research. I wish all the applicants the best of luck and I look forward to the dissemination of the research itself. In other news today marks the beginning of the 8 week free MOOC course on Human Evolution: Past and Future produced by the aforementioned palaeoanthropologist John Hawks. The MOOC, provided by Coursera, takes a in-depth look at human evolution detailing not just the complexity of the fossil record but also of the genetic record. The course includes all the exciting news from the Rising Star Expedition and exciting footage and interviews with palaeoanthropologists at sites from around the world (including the Dmanisi site in Georgia, Malapa in South Africa and others). I am particularly looking forward to the discussion of human evolution within the past 10,000 years and the stunning advancements made with extracting ancient DNA from fossil hominins. I joined this course a few months ago when I first mentioned the course on this blog but you can still join up now. Just remember that the course is split up into weekly topics so you may not want to miss one. I have so far watched the majority of the interesting and well presented videos for the first week, the focus of which is our place among the primates. I cannot wait to join in and participate in the course fully, hope to see you there! Hear Lee Berger talk about the Rising Star Expedition here (9 mins long). The National Geographic Rising Star Expedition blog, informative and up to date. The John Hawks and Coursea MOOC course: Human Evolution: Past and Future. John Hawks weblog, a fantastic resource to learn about the latest articles in human evolution. MOOCs: The Future of Education? It is safe to say that MOOCs (Massive Open Online Courses) are helping to change the way lecturers, students and the public access and engage in the education sector and academic institutions. They are also helping people around the world access education that may otherwise be out-of-bounds to them. Recent articles in The New York Times and the Guardian have highlighted the inherent value of MOOCs, but there are also questions pertaining to the future of MOOCs and their value to academic institutions themselves. A key feature of MOOCs is their accessibility for anyone, providing an internet connection is available, with students taking the courses typically numbering in their thousands, sometimes in the tens of thousands. Another feature, at least for the moment, is the fact that the majority of MOOCs are currently free to sign up for, participate in and to complete. MOOC’s typically come in the form on web-based lectures in which it is up to the individual to take an active part in the learning, relying on self-discipline to complete set essays and/or exams, depending on how the individual MOOC is assessed. The format of a MOOC itself can vary on a number of factors, including who is teaching and creating the course content, who the company that provides the course is, and what institution licences the course itself. Typically a MOOC will include traditional educational course content such as lectures (via online video/audio) and video films, but they can have open goals to achieve and can include expert interviews, participatory science experiments, active online communities to participate in and the opportunity to learn in a more informal setting and diverse student groups. Importantly the student must have self-discipline and self-regulation to access and complete the online content, digital literacy to navigate access to the course and, of course, the time to dedicate to the MOOC. 1) You can move beyond time zones and physical boundaries. 2) You can connect across disciplines and across corporate channels. The student is not tied down by subject matter or discipline, and can cross scientific and humanities ‘borders’ to take part in various individual courses. 3) You do not need a degree to partake in a MOOC, only the discipline to learn and to keep up with the course. 4) The MOOC can be presented in a variety of languages, engaging a wide global audience. 5) Contextualised content can be shared quickly by all participants. 6) You can use any online tools that are relevant to your target region, or that are already being used by the participants themselves (think social media, website forums and instant communication sites). Further discussion on MOOC’s, their benefits and criticisms can be read here. Who Provides and Funds MOOCs? 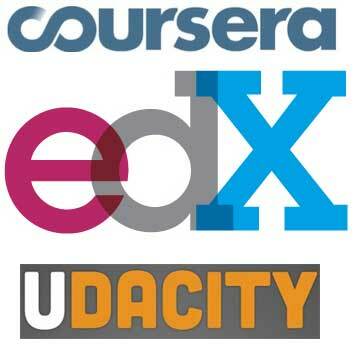 As highlighted in a 2013 Chronicle of Higher Education diagram and short article, the main companies that provide MOOCs include Coursera, Khan Academy, Udacity and EdX. Funding for these companies comes from several different sources depending on the company itself, but can include capital input from non-profit organisations (such Bill and Melinda gates Foundation, National Science Foundation, MacArthur Foundation etc), venture capitalists , universities themselves (Caltech, Harvard, Stanford, MIT etc) or large companies (such as Google and the publisher Pearson). Coursera now charges licensing fees when educational institutions use their courses, whilst ‘gateway’ MOOC courses to university degree programs are typically charged for the student to take part in. Other revenue streams for MOOC providers include employee recruitment, secure assessments, applicant screening, tuition fees and sponsorship whilst Coursera, Udacity and Edx all gain revenue from the certification of completed courses. Some of the main providers of MOOCs (Image credit: Minding the Campus). The MOOC courses above all offer certification on the completion of individual courses taken, and some of them can be used as academic credit depending on the educational institution. I must point out here that a number of different companies, universities, educational establishments and even government’s have set up their own MOOC courses which may not offer accreditation or a certification of completion. Always be aware of the accreditation of any courses that you are taking and take the time to research the company background to see if the course offers any academic credit, certification of completion or accreditation. The British current affairs magazine Private Eye has, in a recent issue, highlighted the ongoing research of UK PhD candidate Katy Jordan, who studies the completion rates of MOOCs across a variety of topics and universities in various countries. The stats and figures makes for interesting reading, highlighting as they do the low completion rates for 29 MOOCs so far studied in the research (an average completion rate of under 10%, whilst Private Eye quote just 6.8%). It is worth noting that MOOC courses are being added to the research dataset over the course of Jordan’s investigation and research. The completion rates are low but, when translated as people who have completed the courses, they typically number in the thousands. Still, it is worth keeping a note of Jordan’s research to highlight the larger themes of why there is such a low completion rate. Importantly MOOC’s offer a fundamentally different way for individuals to take part in education itself. As highlighted on John Hawk’s weblog last month, the success of 17-year-old Daniel, an individual with severe autism, on the completion of several different MOOC courses has opened up the way in which he interacts with the education establishment, knowledge itself and, ultimately, people. The coursea blog article on Daniel highlights how he managed to take part and complete several university level humanities courses, with the help of his dedicated family and the MOOC providers despite his autism. The courses gave him the confidence to help peer review his course mates essays, and to expand his own knowledge and self articulation. This is accessible education for the masses, wherever and whoever you are. It is clear that MOOCs are becoming more and more incorporated and entrenched within academic life at the University level across the globe, particularly in America and the UK. Yet there has been backlash against certain courses, particularly regarding perceived intellectual copyright infringement and the way Universities view MOOC’s themselves. Thomas Leddy, a philosopher caught up in the recent Jan José State University open letter fiasco, highlights the fact that “the vibrant ecosystem of higher learning as a whole will decline because fewer and fewer students will actually be inspired by live teachers or will even read books by such teachers”. His article, in the Boston Review, laments the fact that MOOC’s de-value the effort of reading key literature, critical thinking and the effort of writing critically. Is this view justified? Certainly there are MOOC’s online where there is no critical thinking involved, where the conclusion of the study is a multiple choice quiz, which, it could be said, limits the actual value of completing the course. However that could also be said of certain modules taught throughout the educational system. We are only at the beginning of the MOOC revolution, and I firmly believe that to draw negative conclusions at this early stage is to risk losing out on an important dynamic educational resource when we have already seen so many benefits of the courses to so many people. Ultimately it is clear that whilst there are conflicts of interest between academic institutions, MOOC providers and the people who access the courses themselves, MOOCs are a helpful educational tool. They are able to inform a diverse and interested audience on the latest research developments in a number of disciplines, if they are produced and evaluated in the correct way. In human osteology and physical anthropology it is, to my mind, a given that you must have physical access to actual bones or casts to learn the anatomy and idiosyncrasies of the skeletal system. However a MOOC could, with clear and efficient images, provide a relevant and informative view on skeletal anatomy, human evolution and knowledge of archaeological sites quite successfully. This is where, of course, a combined academic course would come in useful but even so the dissemination of scientific knowledge to a wide audience is heavily encouraged, especially from experts in the field who can communicate clearly and efficiently. It is clear however that neither model of residential university level education or MOOC can outrank or compete with each other. Every educational establishment must offer a variety of ways to learn that offer an integrative learning environment in which both the lecturer and the student benefit. MOOCs offer an important, and possibly integral, part to play in this. I, for one, am keen to see what the future holds for MOOCs, and I look forward to taking part in John Hawks MOOC ‘Human Evolution: Past and Future‘ in January 2014. Scientific American article on MOOCs. Four lessons learned by partaking in MOOCs at Minding the Campus. Five myths of MOOCs at Time Higher Education. Impact of MOOCs on professors at The Chronical of Higher Education. Well I’ve managed to break my right tibia and fibula again (a minimally displaced transverse fracture), this time in the pleasant surroundings of a pub. It’d be fair to say the pain was mitigated by a few pints, but thankfully I was also wearing the plastic splint at the time, a safety precaution after previous fractures, which kept the leg stable and safe until the NHS staff plastered it up. The upshot is that I am finally employed, alas not in the archaeological sector, but in this environment I am very happy to have the job that I do. 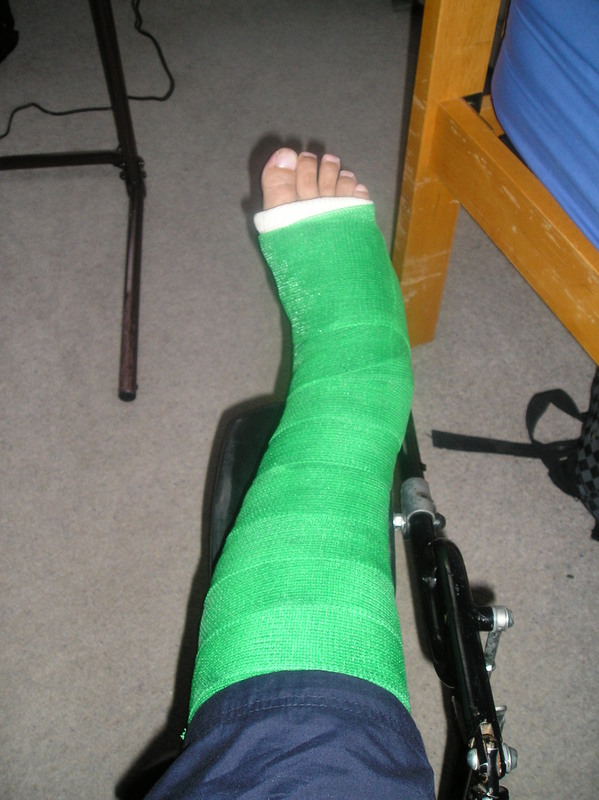 I always choose green for the cast colour as it reminds me of the verdant grasses of summer and of nature; plus it is a bright colour so people will hopefully avoid running or bashing into the leg accidentally. Take note of the bend in the tibia and fibula, and of the offset angle of the foot. This represents a natural deformity, enhanced by several fractures of the tibia. The break has also reminded me primarily why I started this blog in the first place, to focus on human osteology and the skeleton. It gave me a jolt of joy to once again see my own skeleton lit up on the computer screen, to recognise one’s own skeletal idiosyncrasies. If I manage to get a picture or a copy of the X-ray for this fracture I shall put it up as well, as it is quite informative on the effect of Polyostotic Fibrous Dysplasia, as part of McCune-Albright Syndrome, on the deformity of the long bones. It has also highlighted the fact that the Skeletal Series posts have somewhat stalled in the last year due to the completion of the MSc and the subsequent time consuming job search. So you should soon be seeing Skeletal Series entry 11 on the human foot. 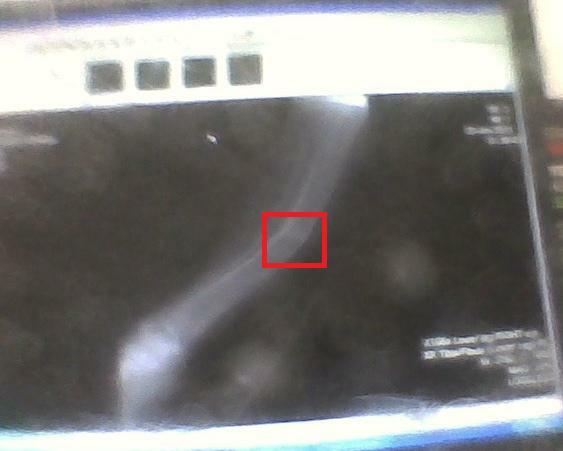 An admittedly poor quality camera phone shot of the an X-ray of the right lower leg, ankle is bottom left. Note the location of the fracture on the mid shaft of the tibia in the red box. The tibia and fibula both exhibit a medial bowing at the mid shaft, with areas of translucence on the bone highlighting the polyostotic fibrous dysplasia lesions. The angle and location of the break indicate a failure of the tibia as a weight loading bone due to the porous quality of both the cortical and trabecular bone, particularly at the angle highlighted. In the meantime I’ll shortly have a post up on the new facet of education that is drastically widening participation at the university level education level, the indefatigable rise of the MOOC. I also aim to write up a quick review of a fascinating book by historian Joel F. Harrington entitled The Faithful Executioner: Life and Death, Honour and Shame in the Turbulent Sixteenth Century, detailing the life of Nuremberg executioner Meister Franz Schmidt, who kept a detailed record of his 40 plus years in the role. It is a fascinating book and an excellent view into the legal and cultural context of the role of the executioner in Germany and Europe in this fascinating period, as well as detailing the personal crusade that Schmidt himself took in gaining acceptance into respectable society. So until then, auf Wiedersehen! The palaeoanthropologist professor John Hawks has released news about an exciting and innovative massive open online course (MOOC) entitled ‘Human Evolution: Past and Present’. The course is to be taught online and will begin in January 2014. John Hawks is a well known anthropologist who studies the bones and genetics of ancient humans, and is the Associate Professor of Anthropology at the University of Wisconsin-Madison. The course will detail all the latest aspects of continuing research into human evolution, and the course will feature expert interviews, mini-documentaries, guided laboratories, participatory science, as well as looking to the future of human evolution with the ‘impact of technology on our future evolution’. This represents the best of open access science, and the chance to participate in a truly worldwide educational initiative. “This course and all its materials will be open and free for anyone, anywhere in the world. As of this moment, more than 6500 people have already signed up for the course. The course is still more than nine months away, and I’ll be developing materials across the entire time up through January” (emphasis mine). Sadly due to US export restrictions the US goverment have now banned Coursera MOOC courses in Sudan, Iran and Cuba. This frankly illogical banning of the freedom of education is indicative of the worst aspects of a government. Read more on the announcement of the MOOC on the John Hawks weblog here, and sign up here for the course. This is a fantastic initiative and one not to miss if you are interested in human evolution and human osteology.